QR code taglib has been updated. For example, add bookmarks QR code etc. See more details here. P.S. and do not forget to check out our QR code maker. Yet another collection of web tools let you create mobile sites (in the most cases - mobile versions for the existing sites). Nice tool lets you publish big photos on the map. The Google Map Image Cutter is an application designed to take any image or digital photo and cut it into tiles which are displayed on a Google Map. Using this tool, large images can be published on the web in a format that allows the user to pan and zoom using the standard Google Maps interface. 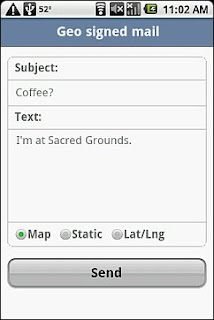 Geo Mail provides an email form where you type your message title and body and choose whether you want to include a link to either a scrollable or static Google map or just your latitude and longitude. When you hit the "Send" button GeoMail opens your device's default Email app with the message and location information pre-populated, all you have to do is specify the recipient and send the email. Our Geo mail mashup on Wap Review site. A new component in our Coldtags suite: Google weather taglib. Lets you obtain weather info (current data and forecast) right from Google. Our HTTP proxy servlet - probably one of the most used Java proxy solutions has been updated. Check out for example an initial parameter headers. Now you can transparently get the headers (e.g. cookies) from the requested party. Our Twitter lists mashup has been updated. Lets you extract top links from twitter's lists. Java servlets filter lets you add default parameters to the requests. E.g. a wrapping (facade) for the existing application that expects to get some predefined set of parameters etc. And now you can even set dynamic values for default parameters. See details here. Many modern blog platforms (most of them actually) let you publish data by email. You can just send email to some service address and platform transforms it into a new post. For example, in Posterous you can send data to post@your_blog.posterours.com, in Friendfeed it is share@friendfeed.com, in Blogger you can set address in Settings->Email&Mobile tab etc. 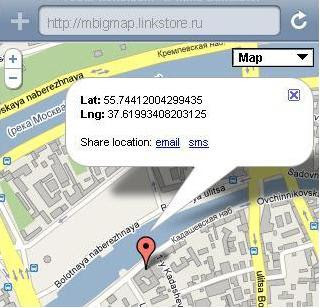 A new mashup Geo posts lets you create a personalized mobile web application for posting geo related data to your blog. Just set a service email address in the form below and get a link to mobile web application for iPhone, Android or S60 platform. This web application lets you email new postings right from the map - just click on the draggable marker presents the location. And application automatically adds to email a link to the location. So your posts will have a direct link to some map. It is probably the easiest way for sharing locations, write about some check-ins, lets your readers to see the place you are writing about etc. How to post Google buzz by email. From here. Google Buzz on the map. Mark your geo points right from the map. Our bookmarklets suite has been updated. In particularly, Google Buzz support has been included. Chat engine – servlet that implements a base (central hub) for web chats. JSON based API lets you create rooms, users, create and request public and private messages. We choose JSON as a basic API, so your web chat could be implemented on mobile web too. A full source code example for the basic web chat is included. See it here. How to deal with Google Buzz from programmers point of view - Google Buzz API. (it is a mobile site). Yet another way to share your location without going to some social network. Just send your data directly. An interesting idea from Google - Store View. Google Store Views will allow people to essentially walk into the store, off of Google Street Views. So for example you are looking at this store, and then you can click on the door to enter it, all on Google Maps. Then when you enter the store, you can wall through it. P.S. As per Street View let us point your attention to our mashup Tweet Street View. You can see Street View and either an appropriate map or a list of Twitter messages nearby. Here is a description. A nice collection of online tools that will help you to create or convert websites into mobile format. QR code maker - create mobile site for any content just with copy/paste. Step by step guide: "How to mavenize a typical web application build". From here. It is by the way what we need to do with our servlets suite. How to: OpenID for Java web applications. Text stats on Coldtags suite: Text stats taglib. This component lets you count symbols (words) in texts. Actually we’ve used it in mobile web development for example.